Our Bakery Hours are Monday thru Friday from 7 a.m. to 6 p.m. & Saturday 7 a.m. to 5 p.m.Place your order by calling or stopping by the bakery. Please place orders of 10 or more by 10 a.m. to receive the best possible service. 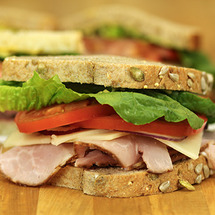 We are happy to deliver for lunch orders of 10 or more. 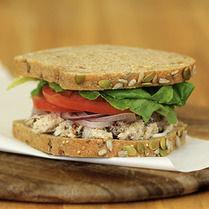 Chunks of white and dark meat chicken in a seasoned mayonnaise with our very own sweet & spicy pecans. 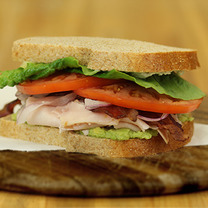 Tender slices of turkey, guacamole, and bacon. Tender slices of honey smoked ham and Swiss cheese.